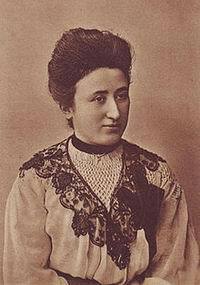 Birth of Rosa Luxemburg, Polish-German Marxist revolutionary (1871-1919). In a time when the socialist movement is evolving in directions increasingly removed from Marx’s positions – Social Democratic reformism on the one hand, and Leninist bureaucratic centralism on the other – Luxemburg is the leading exponent of a Marxism in the spirit of Marx. Luxemburg’s politics are centered on a revolutionary perspective: she supports pressure for reforms within capitalism, but is clear that reforms cannot bring about fundamental change, that socialism can only come about through revolution, and that the activity of socialists and socialist organizations must always be oriented to the ultimate goal of revolution, no matter what the exigencies of the present situation. Luxemburg advocates a principled tactical flexibility, adapting tactics and organizational forms to the situation while remaining clear about goals and principles. She strongly believes in the importance of political organization, but does not believe that a political organization can direct the political struggle along pre-determined lines; rather, she believes that effective organization is as much the product of struggle as its instigator. 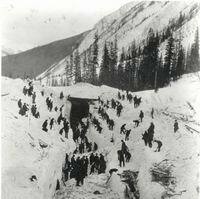 The Rogers Pass disaster. Sixty-two members of a railway maintenance crew sent to dig out a snowbound locomotive near Rogers Pass, British Columbia are killed in an avalanche; one worker survives. Mohandas Gandhi makes a deal with Lord Irwin, Viceroy of India. Gandhi agrees to stop the civil disobedience movement in exchange for the imperial government’s agreement to free political prisoners and allow Gandhi to participate in a conference in London. When he arrives in London, Gandhi finds that the British have outwitted him: having achieved their goal of shutting down the civil disobedience movement, the British refuse to offer any concessions at the conference, let alone discuss Indian independence. The UK miners’ strike begins, a decisive event in the history of the British labour movement. The strike ends in the miners’ defeat, and allows Margaret Thatcher’s right-wing Conservative government to proceed with a sweeping neo-liberal re-organization of the British economy.